Available in up to a 6 brick LED system in 5000K Cool White (+/- 500K) or 4100K Neutral White color temperatures propagated with Philips Lumileds LUXEON® T LED’s. Available with 90-300V 50/60 Hz Class II power supply. 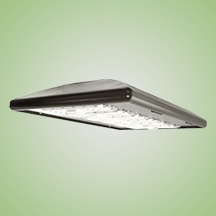 LED’s rated over 425,000 hours (TM21 Calculated L70) at 25°C ambient temperature with selectable 700mA or 1050mA operation. Lumen Maintenance >97% at 50K hrs. 347V and 480V input options available. Standard 0-10V dimming. Fixture provided with integral 10kV surge protection that meets IEEE C62.42.2-2002. Built-in Active PFC Function. LED Power Supply conforms to UL1310 Class 2 and UL8750 standards and is IP67 rated for wet locations. Standard mounting options available are a 2” adjustable slip fitter for horizontal tenon mounting (see 2AF in the Accessories Section), and a spider mount. Additional mounting options may be available for custom applications. NOTE: An adaptor to provide a horizontal tenon must be utilized for slip fitter mounting.